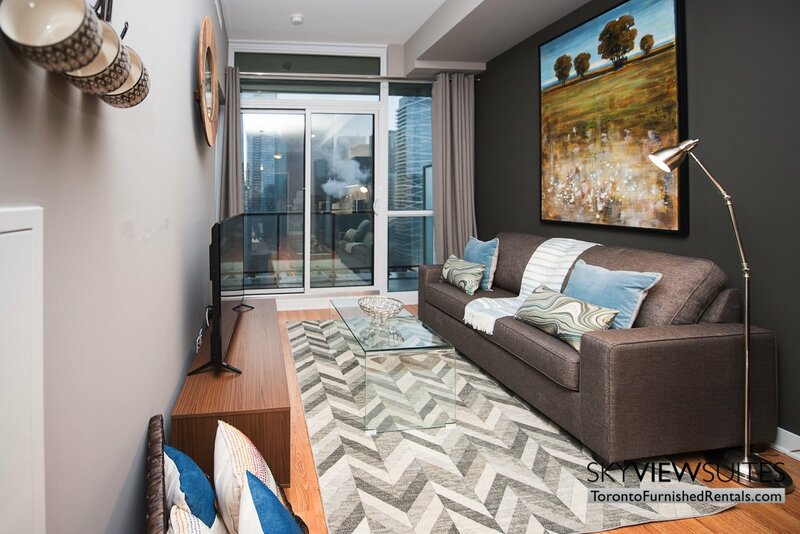 Our Adelaide C furnished apartment is sure to impress any guest during their stay in downtown Toronto. Complete with floor to ceiling windows, honey coloured hard wood floors, a private balcony and tasteful modern touches. When you enter the apartment a space enveloped in warm tones and natural light will welcome you. To your left you will find a small den and the apartment’s 3 piece bathroom. The den comes complete with a modern glass desk, which is the perfect place to study or do a bit of work all from the comfort of your apartment. The bathroom comes complete with a modern vanity sink with plenty of storage hidden beneath in a dark wood cabinet. 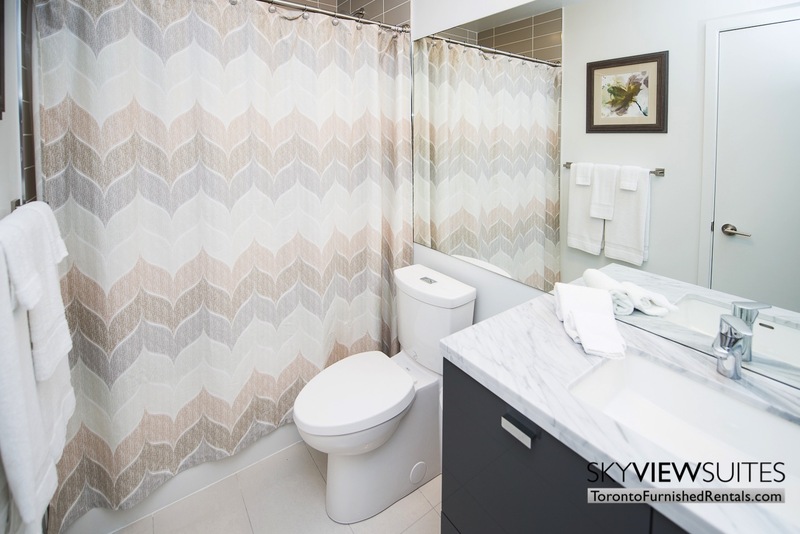 Guests will also find a modern shower/bath combination as well as all the towels you may need during your stay. The kitchen is spread out across one of the walls of this serviced apartment. 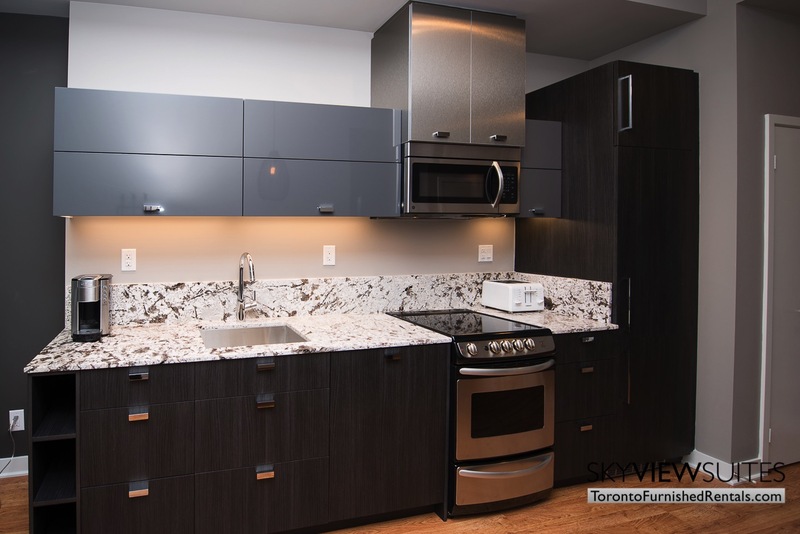 It features striking charcoal grey cabinets and a light marbled countertop. Guests will find that this kitchen is fully equipped with all sorts of kitchen utensils and appliances. From essentials like glasses, plates, bowls and cutlery to a personal coffee machine, this kitchen is well stocked. A step away from the kitchen is a black dining table with enough seating for 3. The main living space of this furnished rental is the perfect space to relax in front of the TV after a long day in the city. A plush, grey love seat frames the area and sits across from a small entertainment centre complete with a new flat screen TV. This TV comes complete with a DVD player and Rogers VIP cable package for your viewing pleasure. If the Toronto weather is co-operating, you can also venture out onto your own private balcony from here. Enjoy your morning coffee or take in the city lights at night. 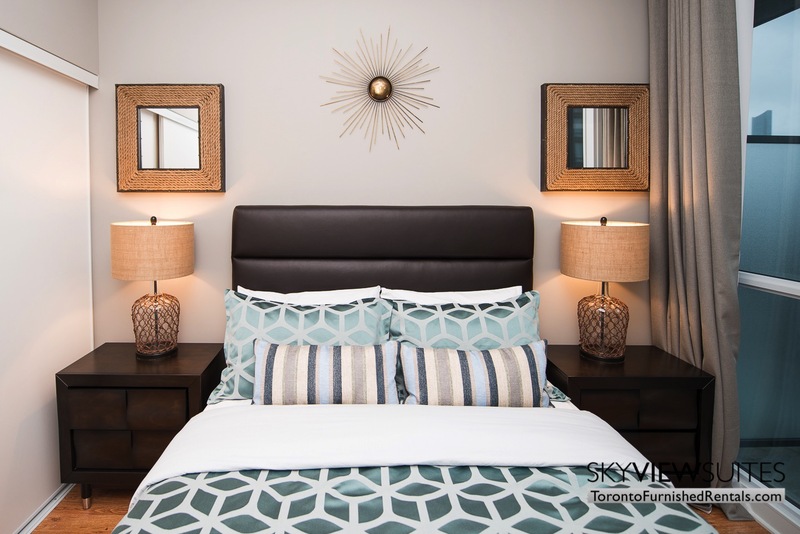 Last but certainly not least is the bedroom of this apartment. One wall of this room is comprised of floor to ceiling windows which allows for an unspoiled view of the city below. Sleep will come easily in the queen sized bed complete with comfortable cotton linens and plush pillows. 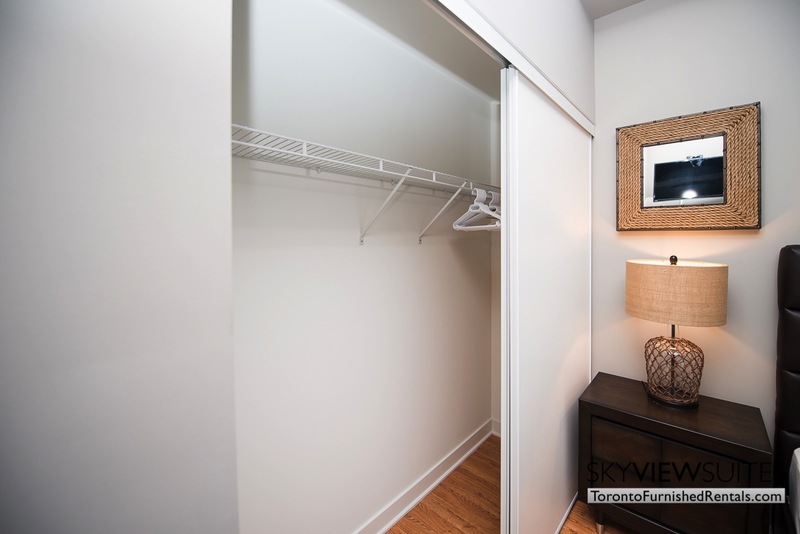 There is also a large closet complete with sliding doors to satisfy all of your storage needs during your stay. You can also spend a Sunday morning lounging in bed watching your favourite TV show on the wall mounted TV set. 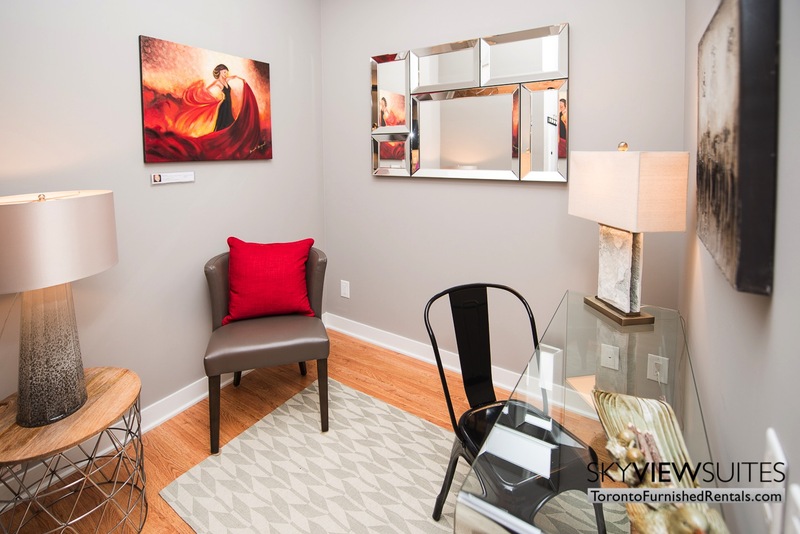 If you love this apartment but need just a little more room check out another one of our executive rentals with 2 bedrooms, in the same building. 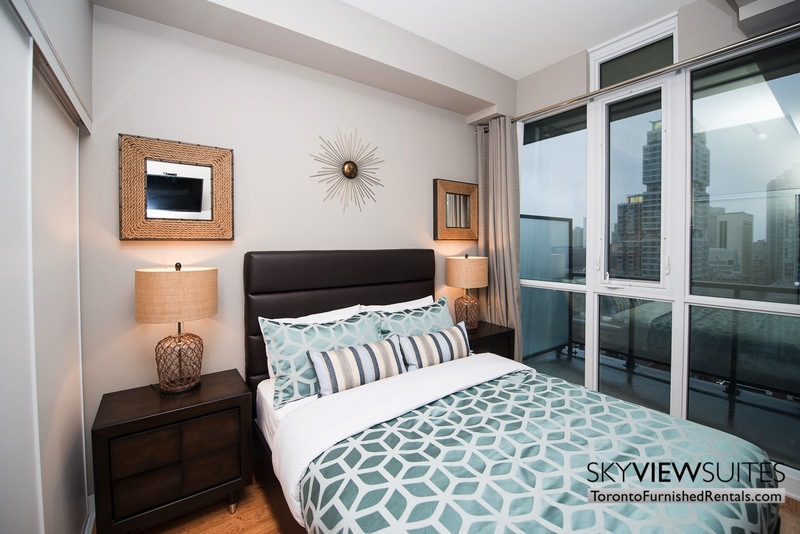 This unit is conveniently located in Toronto’s bustling Entertainment District. Just as the name suggests there is an endless array of entertainment, restaurants and activities right outside your door. Film fans will be pleased to know that this unit is located just around the corner from Toronto’s famous TIFF Bell Lightbox. Even if you don’t visit during the world renowned Toronto International Film Festival there are always events and film to see at this modern cinema hub. 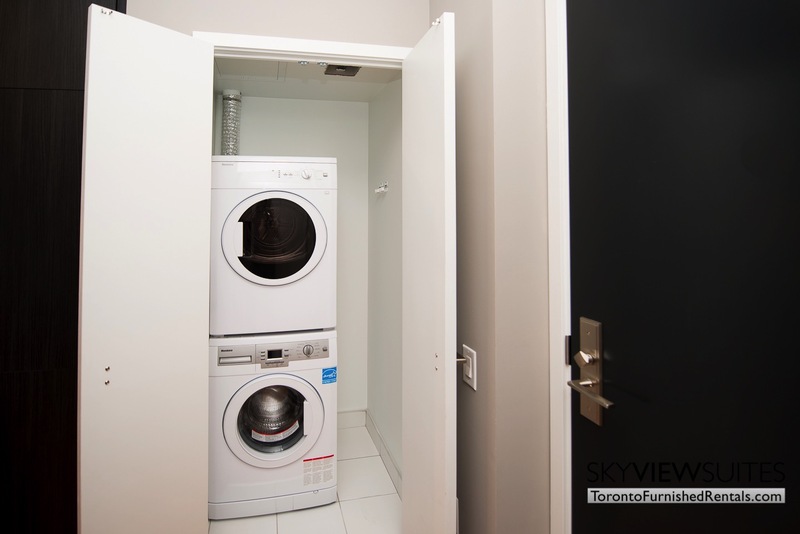 For guests visiting Toronto for work, this unit is also in an ideal location. The Entertainment District neighbours the financial district, which is the home to some of Canada’s largest financial towers and international businesses. Transit to other areas in Toronto is also an easy feat. With quick and easy access to both streetcars and the subway system, you can get anywhere in the city in no time. 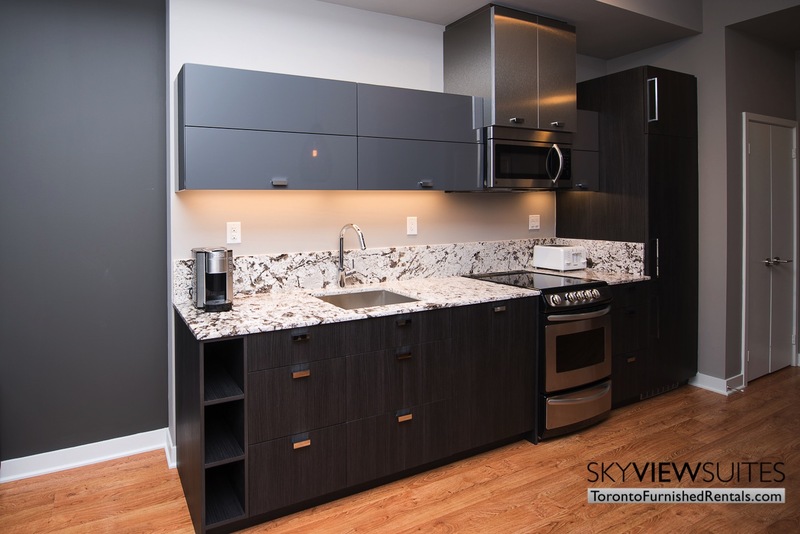 This Adelaide suite is located in a new, modern building in one of the most sought after areas in Toronto. Some of the amenities include a theatre, games, room, lounge, guest suites for overnight visitors, dining room, and a bar. This building also has a state of the art fitness facility that features treatment rooms, yoga room, aerobics room, spinning room, cardio machines such as elliptical and treadmills and a weights room. Guests can also take comfort in knowing that the building offers 24hr security.